A popular subject of discussion amongst the Shenmue fan community is what lies in store for protagonist Ryo Hazuki as he draws closer to the villainous Chi You Men organization, to which his father’s killer belongs. 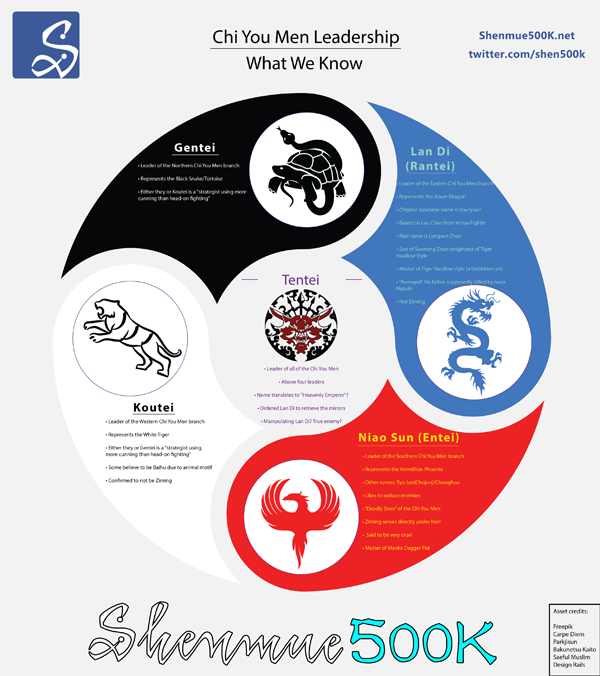 Shenmue 500K Facebook admin Norris Girdy has compiled a chart of known information about the leaders of this outfit, based on details supplied in-game as well as further research including interviews given by series director Yu Suzuki to fans and media. – There is a misconception that Lan Di is actually Xiuying’s brother Ziming. However it was revealed in a side comic in Shenmue 2 that Ziming is someone that is completely different. Not Lan Di. – For years Niao Sun has always been associated with her alternative names “Tyo Jun” (Chojun in Japanese) and “Chonghua.” These may be codenames for her, or one may even be her real name. While it’s unclear where Chonghua originates, Niao Sun is referred to as “Tyo Jun” by the narrator in the Shenmue Premiere video. “One of ‘the Four Leaders’ of Chi You Men, in charge of the south. She wears voluptuous red dress, and her manner seduces people. Her fearful eyes that pierce everything are always seeking chases. – Yu Suzuki himself emphasizes how “scary and cruel” she is in Shenmue Master’s 2013 interview with him (8:57). – Niao Sun is simply described in this way on the official Shenmue 3 Kickstarter page. – After years of speculation, it was finally revealed back in 2015 in an interview with Yu in Hobby Consolas magazine that Niao Sun is a master of the Mantis Dagger Fist style. – It has been hinted that Ziming Hong (Xiuying’s brother) not only joined the Chi You Men, but may even serve directly under Niao Sun given that they are shown in a side comic together. – For years now, the Shenmue community had believed Ziming Hong (Xiuying’s brother) to be one of the leaders of the Chi You Men, specifically the leader of the West. 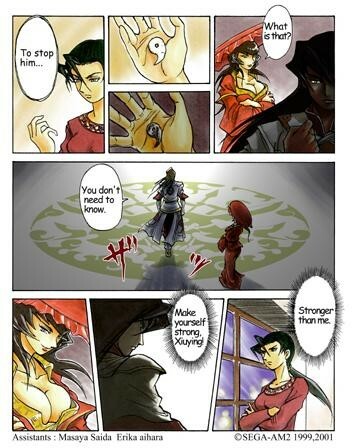 This is due to Ziming appearing in the side comic along with Niao Sun dressed in white. 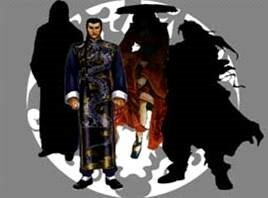 – Ziming’s character also looked VERY similar to one of the shaded figures in the famous Chi You Men leader picture (the one on the far right). – However, a member of the Shenmue community, David De ville, had the privilege to sit down and interview Yu Suzuki. In this interview, he revealed that Ziming is in fact NOT a leader of the Chi You Men and that we have not seen the other two leaders yet. 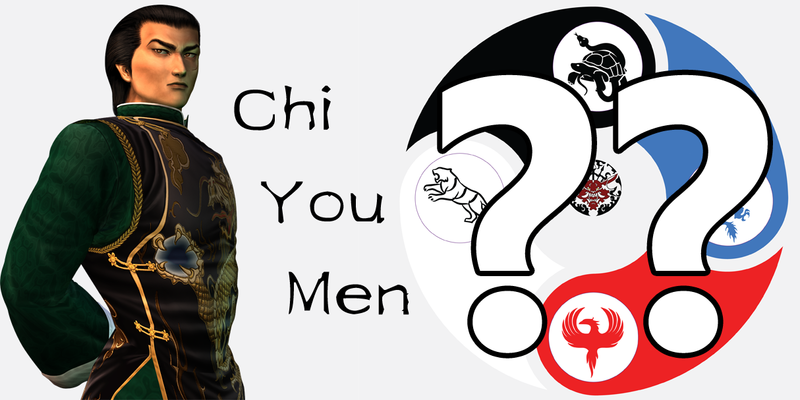 There is still a very high chance that Ziming did in fact join the Chi You Men however and is an extremely high ranking member. @EyePatchWolf We all needed this. Shenmue actually looks more interesting then I thought.